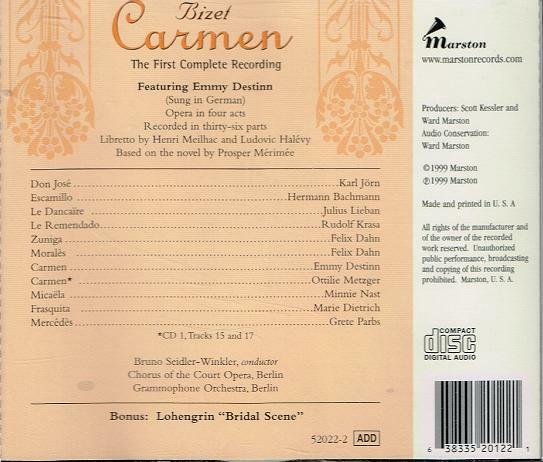 “This fascinating German language CARMEN was recorded by the Gramophone and Typewriter Company in Berlin during the week of 14 October 1908. 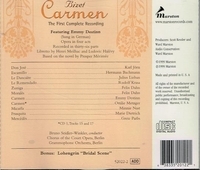 One of the first efforts to record a complete opera, it has always been known to collectors as ‘Destinn’s Carmen’. Her unique voice and vivid, exuberant personality completely dominate the recording. This performance, of course, bears little resemblance to Bizet’s original opéra comique which, by definition, made its extensive use of spoken dialogue. 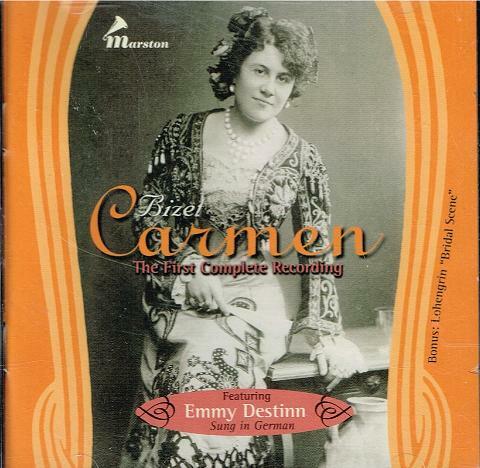 But, from the beginning, CARMEN traveled well, and the German language seems to sharpen the edge of the drama. While the harsh, somewhat throaty sounds lack the insinuating subtlety of the French, the opera sustains its intensity.